Slovenian company Alfastreet is known worldwide for its automated roulette solutions, but there is far more to the company than some might first suspect. Not only are they responsible for the industry-standard R8 eight-seater automated roulette, they also make signage, furniture, boats and can furnish your interior design needs. The common thread linking these different facets of the company is quality, something that alongside customer service has stood the company in good stead over its 20-year presence in gaming. Albert Radman, the company’s Sales Director, talked to Casino International about the company’s origins, its ethos, and its future. Casino International: Where did Alfastreet originate? Albert Radman: Alfastreet started as Pockaj 41 years ago; it was a family business actually, which started in what was Yugoslavia providing furniture for libraries, schools and offices. The quality was always a priority, even back then, whatever we were producing. Twenty years ago, we were asked to make wooden parts for the gaming industry. The son of the owner took care of these requests, and eventually he got an idea of his own, to create what is known today as an eight seater automated roulette. So in the evenings, he was working on developing gaming products, and the new branch of the company took the name Alfastreet. In a way, our entry into gaming was quite spontaneous but because of the quality and development, we became number one in the market over the years. It started with Roulette, which is still the number one game in casinos. I would like to emphasise that Alfastreet is the original gaming company from Slovenia. There were afterwards, but they all look up to us and follow what we do. Most of them were even our customers at one point. CI: How did the company develop? AR: The development of our company was always based on ergonomics; the comfort of the player at the machine was paramount, and to provide the best quality materials and development. We have always invested our energy and time into developing these things. It’s something you won’t find in our imitators, we always look through the eyes of a player. That’s why players have made us number one, we didn’t put ourselves there. When Alfastreet is played in a gaming location, if it’s next to a competitor’s machine, players migrate to our machine. That’s why casino owners, when they get feedback from players, request more Alfastreet machines, and that’s how we have succeeded. The second thing that we do best, is simplicity. We make our games as simple as they can be, to fully comfort real casino players. We study each specific market, we test and we learn about the habits and the likings of the players, and we come up with the game design designated and customized to fit perfectly. Human beings should always be creative and developing ideas – they should not be copying all the time. It’s against human nature to just imitate somebody else’s products. You can’t respect people that just copy your work, but imitators are out there and in a way it’s a compliment, but they are not building with the quality we are. In Slovenia we have a saying: I’m not so rich to buy cheap. It means, if you buy something cheap, you will some time soon have to buy again to replace it because it will get broken, so you are buying twice. The quality you get with Alfastreet is almost like a nice problem for us because when we bring new products to the market, our customers are saying ‘But what we have from you is still working perfectly!’ So we have a stable market but that is not always taking new products because what we have made is doing so well! It almost seems to be working against the capitalist model, where you supply materials with a finite life span so you have to replace them with new – and sell more products. Alfastreet does not do that. It’s quality first, that is most important. That’s why our machines are on the floor for 12, 15 years, still working, still earning their place. CI: Given the company’s origins, it’s changed a lot… And you still work in some diverse areas. Why is that? AR: Since we started in this field 20 years ago, a lot of things have changed. It started as a small part of the company, now it is the core of our business. We still provide interior designs and build furniture for casinos, if they are refurbishing we can work with their designs and provide a very complete service. We have requests because it is something we are still known for, and they know the quality of our Roulette products. The marine side of things, well, Alfastreet’s owners love boats, they love the ocean, boat shows, all of that; Iztok Pockaj, General Manager, Designer and Founder of Alfastreet, realised he could not find a boat for a reasonable price that had everything he wanted on it. He then developed his own ideas, and six years ago he started a new brand in Alfastreet Marine; we now offer three different of boat with different sizes and vast range of customization options. This side of the business is growing, visibility is increasing, and it is another string to our bow. CI: 20 years ago was your entry into gaming in your domestic market? AR: No, at the beginning the first request came from abroad. Demand was high very quickly; we were recognised as a company that developed something the market really needed, especially our R8 machine which is still unique and still best-performing on the market. It’s an eight-seater with a wheel in the middle and it still gets attention from players around the world. To develop this, as the owners did… I don’t know if it was luck or just brilliance but it brought immediate success. I must say, once again, Alfastreet was the first in the world who created this concept, and others followed. We also developed single terminals at this time, which can be added to the R8 roulette or be standing alone, connected to different wheels. 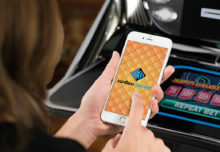 It gives players the option to play different games, and to add as many games as an operator wants to one seat – so as many terminals as you want can connect to a single wheel or a live wheel, and so many more options to play. Today the player can play four games simultaneously;which is also unique in the gaming world. Once a casino sees what the terminal can bring to their venue, and see what they can do with it, they want to have it. But some markets are more traditional, they prefer the eight-seater but as markets grow, they are moving toward the options to add different games. If they have an R8 they can then add games and player options with the single terminal machine. They are very important for us in many markets worldwide. CI: I gather you also sell used machines – is that a big part of the business? I have been all over the world and sometimes, you see a machine that’s been bought from a reseller – and in many cases, that is more expensive than buying from us! – and they have no support, and they have seats down for months, or even the whole machine; they are not getting support from the seller, and they are stuck with a machine they paid good money for. So we are shouting about this now, about selling refurbished machines: you can buy used machines from us and we will support that purchase, and you will get all of the respect you can because you are a client that paid for something that should be working perfectly. I get heartache when I see operators being disappointed by our products, simply because they chose seemingly cheaper option. Our name stands for quality and we try our best to rectify these situations. CI: What about trade-ins? Is that how you source the used machines? AR: That’s our main source for refurbished machines, when people trade in an older machine for a newer model. Our customer typically knows if there is a new development and they can afford it, and they know historically their revenues on the casino floor are highest from their Alfastreet machines, so where possible, they like to upgrade or add extra machine of ours. Some casinos just close down or suffer from a legislation change, that’s another source of our refurbished machines. We want to encourage anyone that has Alfastreet stock not to sell it on, but to call us for our best offer. CI: What separates you from your competitors? AR: Our relationship with our customers, our care for our machines and their performance, and our honesty, these are the things that make us stand out. We are proud to always address any problem, to assist where the assistance is needed, to help the ones that need help. Our customers are loyal to us because they know they are getting more than just a machine. CI: Which are your strongest markets, and where would you be looking to develop? AR: Asia is still very strong, the demands from there are really high; Europe is growing. Latin America is very strong, and Africa is also growing. All over the world we are strong, I can’t say there is one market that is of greater importance. Of course we are always looking at where economies are growing and markets are opening up. South America, the Caribbean, Africa are all growing markets so they will develop and have more success. Other markets are still looking for new products but are not as hungry as emerging markets. The US market is developing for us, though we have not been in it for long; we need to add to our impetus there, we have installations that are performing well but our name and the quantity of machines needs to grow there so we can be number one there, too. You have to focus on the US, and gain the trust of your clients to get space on their floors. It needs time. We work with distributors in some markets; you need to have a local presence sometimes, though each market is very specific. Local knowledge is very valuable but many things are still handled by us here in Slovenia. CI: How do you stay competitive in those markets? AR: By doing what we have done in recent years; we will continue to work this way: with honesty, with the best quality we can provide, and with the support. But there is also our pricing and payment terms, these are also flexible and our prices are extremely reasonable in our sector. For a really reasonable cost you can have a machine that might operate for 15 years on your gaming floor, that’s 15 years of support and 15 years of revenues, for a price you might make back in just couple of months. Some competitors we cannot really describe as such because they are such a small operation, working out of a garage, for example, they might not be around tomorrow. Their machines might be slightly cheaper but the parts are of questionable quality and there is always a question of follow up support, durability and overall experience. AR: That’s true. Nothing in Alfastreet is outsourced, it is all made by our own employees; one of the things that separate us from some other companies is our team spirit, we are all working toward our success and we have fun while we do it. There is real energy and it is focussed toward having the best product and to be the best in the area that you are working. Each individual here is respected, and we have many team building events: we go skiing together, we have a cycling day, we play soccer together, and we have Pasta Day, where Iztok (the boss!) cooks for the whole company on his birthday. We are open to each other from management down; we are all on the same level with respect for each other and we are proud of the company we work for. “As lots of clients saw in London in February, we have launched several new machines. One of those we had been asked many times to develop, and now we have; clients were asking us, can you make a horse racing game? Some specific markets are asking for this, players are asking for cabinets to have moving horses on them; it’s called Alfastreet Royal Derby and we are expecting it to be ready after testing in the fourth quarter of 2014. Beautifully designed as other products that we have, is leaving amazing impression when our clients see it. “WOF was first presented in 2013 and is really something striking on the gaming floor, and it’s bright with lots of colours. It’s four metres high and wide – though we have smaller versions also – and we can make different colour combinations. It’s so unusual and so very simple that players can pick it up right away. “SL and SL Gold are two other single terminal designs from Alfastreet, with different ways of showing the player the action. SL allows picture-in-picture options, while SL Gold has two extra displays of 5” or 7” on top. The look of the cabinets is different too, with SL a darker look and SL Gold has a cleaner look with white carbon on the sides and back and LED lights adding to the look in the colour of the operator’s choice. Both machines were designed to meet the individual requirements of space and interior design of each casino. 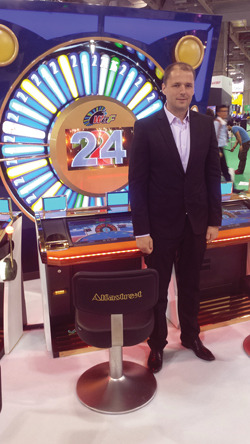 G2E ASIA: The best show in town?